Dunn, Robert G. "Bob" 94, of Princeton, MN died peacefully at his historic family home on March 15, 2017. Bob was born on January 25, 1923 in Edina to Dr. George and Marguerite Dunn. A graduate of Blake School and Amherst College, he served in the Marine Corps during WWII and the Korean War. Bob's distinctive crew cut was his trademark from age 10. After military service, Bob moved to Princeton to work on the family's newspaper and later owned Inland Lumber. 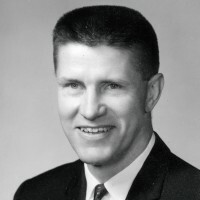 Like his grandfather, who was a Minnesota legislator and a candidate for governor in 1904, Bob was a progressive Republican and served in the state House and Senate from 1965 to 1980. Members of both political parties respected Bob as a statesman behind environmental laws that put Minnesota at the nation's forefront. His legislative work also prioritized education, good government, and the concerns of his constituents. He was appointed by both DFL and Republican governors to chair state agencies and serve on citizen boards. Bob's effectiveness stemmed from his trademark ability to work across the aisle to find solutions that brought people together for the common good. Not one for awards, he received many for his leadership. Always a steadfast environmentalist, Bob served on the boards of advocacy groups to help hold government's "feet to the fire" protecting Minnesota's natural treasures. In his lifetime, Bob and his family planted more than 20,000 trees. Bob married Mary Louise Caley in 1951 and together they had five children. Mary Louise passed away in 1969. He married Bette Lee Hedenstrom in 1972 and enjoyed a loving marriage of 44 years. Bette has two children from a previous marriage so for several years, Bob and Bette had seven teenagers in the house! In retirement, Bob and Bette enjoyed travel, the North Shore and family gatherings. Bob was an inspiration to his family and many others. He will be missed. Bob was preceded in death by his wife Mary Louise; his parents; and sisters Dorothy Hall and Jean Robb. He is survived by his wife Bette; children Ruth Dunn (Steven White), Susan Dunn (Chase Van Gorder), George Dunn (Donna Harris), Libby (Nathan) DunnQuery and Bill Dunn (Sara Damon); step-children Bob (Victoria) Hedenstrom and Mary (Roland) Leirmo; 14 grandchildren; 2 great-grandchildren; and nieces and nephews. Memorials can be made by donor's choice or to the First Congregational Church in Princeton. Bob's service was held March 18, 2017.